The Disney movie, “Secretariat,” will be released on Oct. 8, but many, including myself, have already seen it or plan on seeing it before its opening. There already have been reviews published, most of them mixed. This is not a review, but a merely a look at the real Secretariat through my eyes, my lens, and my recollections through a kaleidoscope of colors and images that it is hoped will bring Secretariat to life for those who did not have the privilege of seeing him in person. 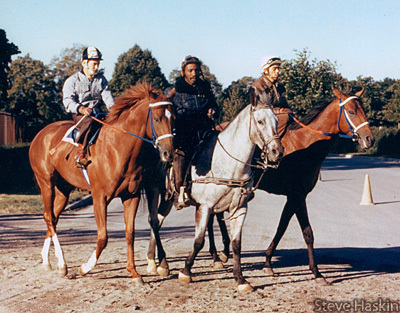 On Wednesday, as Part 2 of this blog, I am reprinting for the second time a feature I wrote in 2002 on Secretariat’s grooms when he was growing up at The Meadow. Although the story was first reprinted two years ago, some on here now may not have read it, and I am hoping it provides a look back at an era long gone and a group of people whom time has passed by. It also is a look at a once great empire that has sadly decayed with the years. The only comment I want to make regarding the film at this time is, despite the many liberties taken, the bizarre depiction of some of the characters, and its downright silliness at times, I do wish the movie well and feel it will do well in mainstream America, especially with its high-profile cast and exciting race footage, which extends into the starting gate for some outstanding close-up shots. The story and the characters are compelling enough, and to the masses that’s all that will matter. The numerous flaws won’t even be noticed by the majority of the viewers. To those of you who do notice, you’ll have to deal with them in your own way. 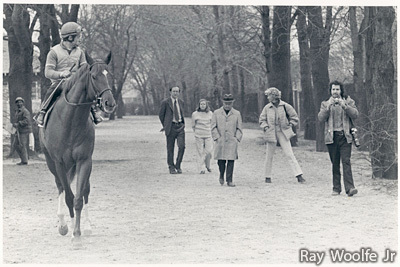 This first photo, the only one not taken by me, was shot by Ray Woolfe Jr. and appeared in his book “Secretariat.” In the photo are Secretariat, with Ron Turcotte up, Penny Tweedy, Lucien Laurin, groom Eddie Sweat (far left), and a nerdy-looking guy (me) with a God-awful 1970’s look. I don’t know who the other two people are. 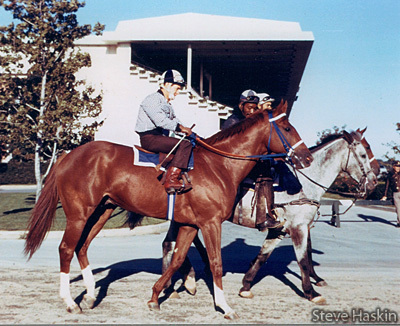 The photo shows Secretariat on his way to the track for a one-mile workout prior to the Wood Memorial. Penny was unlike any high-profile Thoroughbred owner up to that point. No female owner had been seen on the public stage to that extent. Most were elderly matriarchs who kept a low profile, but Penny was attractive, sharp, extremely articulate, and knew how to deal with the public and the media. 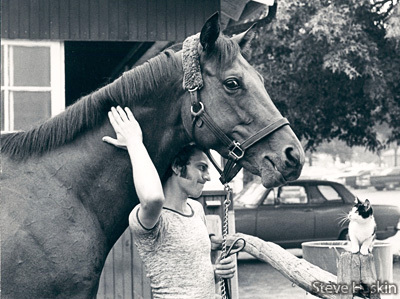 By the time Secretariat came around, she was already a public figure through Riva Ridge. It was Riva, not Secretariat who “saved the farm,” having been voted 2-year-old champion and winning the Kentucky Derby and Belmont. And to this day, Riva, who was a kind, gentle soul with lop ears, remains closest to Penny’s heart. This photo of Riva, with a feline admirer staring up at him, was taken the morning after he set a world’s record in the Brooklyn Handicap. 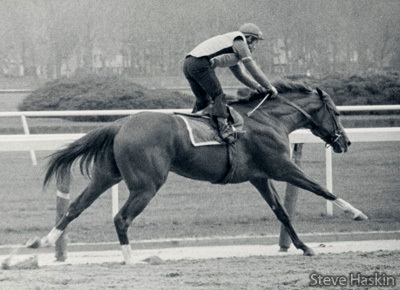 This next photo is Secretariat working a mile for the Wood Memorial. You can’t help but notice his gargantuan stride and the muscles rippling through his massive neck. 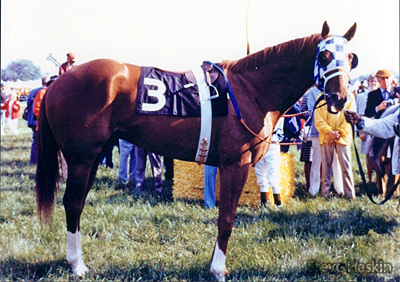 One of my favorite photos of Secretariat is this one taken after being saddled in the infield for the Preakness. Big Red stood motionless looking straight ahead. I was the only one standing on this side of him, and after taking a photo of him, he reacted to the clicking of the shutter by turning his head and staring right at me, or should I say through me? Those eyes peering through the blue and white blinkers make this one of the most special photos I’ve ever taken. I wish I could find the photo I took of Sham, who was being saddled nearby. The unfortunate Sham was spectacular-looking in his own right, and on this day, his dark, dappled coat glistened like burnished copper. 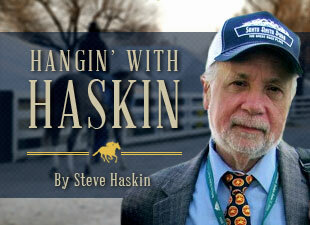 I remember being awestruck by him as well, and cannot remember ever seeing two better-looking horses at one time. 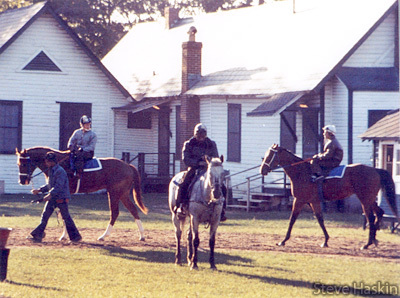 The next three photos were taken on a glorious fall morning at Belmont, as Secretariat and Riva Ridge prepared to work on the grass. 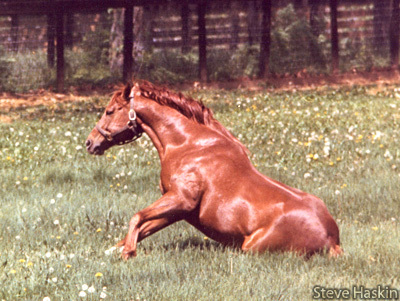 Secretariat would run in the Man o’War Stakes and Riva the Woodward Stakes. But a sloppy track changed those plans. It was a terrible decision to run Big Red in the 1 ½-mile Woodward (in the slop) only two weeks after he set a world’s record going 1 1/8 miles in the Marlboro Cup, his first start since his illness in August. Laurin had to rush him to make the Marlboro Cup, and only after he worked five furlongs in :57 flat, “galloping out” six panels in 1:08 4/5, three days before the race was he declared fit and sharp enough. In today’s jargon, Secretariat was ripe for a major bounce. Even in defeat, he still ran the third fastest mile and a half in Belmont history, coming off a slow mile work on the grass. Amazingly, he came back only nine days later and set a new course record for 1 ½ miles in the Man o’War, beating Tentam by five lengths, with Big Spruce another 7 ½ length back in third. 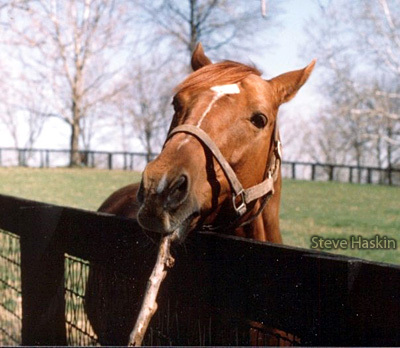 At Claiborne Farm, Secretariat, whose favorite treat was Certs breath mints, brought over a large branch for me to pull out of his mouth. And, finally, I was fortunate enough to catch Secretariat looking like the Phoenix rising from the ashes.